Baku 2015 European Games has announced that food producer Azersun Holding and supermarket chain Bazarstore are now Official Supporters of the inaugural event. Both companies are household names in Azerbaijan, and will bring enhanced visibility to the Baku 2015 brand, helping to raise awareness and increase anticipation for the Games. As Official Supporters of the event, Azersun Holding and Bazarstore will benefit from unrivalled marketing activation opportunities in the run-up to and during the Games. 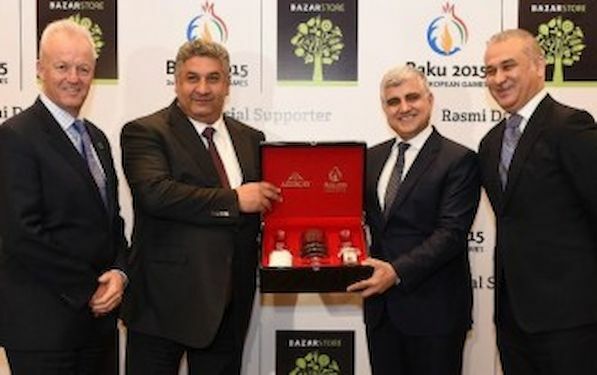 Azersun Holding will be the Official Tea Supplier of Baku 2015 through its brand Azerçay, which will also be the provider of Official Tea Products of Baku 2015. Azersun Holding has the right to use the Baku 2015 logo and composite branding in marketing and promotional activities, including to feature the Baku 2015 logo on the packaging of Azerçay products and composite branding in TV adverts leading up to the Games. Bazarstore has been granted the rights to produce all official Baku 2015 merchandise for sale to the public. As the Official Supermarket of Baku 2015, Bazarstore will retail official Baku 2015 merchandise from its flagship store, a number of pop-up outlets, and a location at Heydar Aliyev International Airport. Baku 2015 branding will feature in Bazarstores across Azerbaijan, on the company’s vehicle fleet, in-store promotions, staff uniforms and customer carrier bags, and in billboard advertising. The contracts mean that Baku 2015 now counts seven Official Supporters, with Bazarstore and Azersun Holding joining McDonald’s Azerbaijan, Milla, Motorola Solutions, Sitecore and Tickethour, as well as seven Official Partners, Azal Airlines, BP, Coca-Cola, Nar Mobile, P&G, SOCAR and Tissot.